Add touch of Southwest Americana to your look withe Lea Collection, featuring a warm chestnut and sepia brown enzyme-washed canvas, accented with brass star rivets. Lined with antique white and grey ikat print fabric. Trimmed with copper leather and antique brass hardware. Lea Market Tote, part of the Bella Taylor line by VHC Brands. 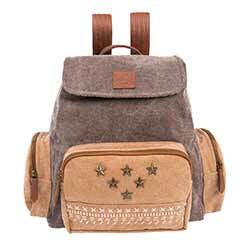 Lea Rucksack, part of the Bella Taylor line by VHC Brands. 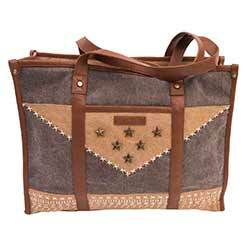 Lea Wanderlust Tote, part of the Bella Taylor line by VHC Brands. Lea Weekender, part of the Bella Taylor line by VHC Brands.